When new seasons hit, it’s time to cleanse and clear your home. With new beginnings in mind, there’s no better time to give your home a good scrub-down and organizational makeover. In case you missed it, check out this article about mindfulness shifts and the importance of improving your space to stay committed to your goals — no matter what they are. Assigning meaning to the space around you will help you be more purposeful and cultivate the lifestyle you want. Today, I’m sharing some of my tips and tricks for de-cluttering and organizing your home. First things first, you want to do a good edit of your closets and pantry in every room of your home. Are you maximizing the space you have? Do you really need everything you store inside them? If you can’t find a reason to keep something, then it probably means you don’t need it. 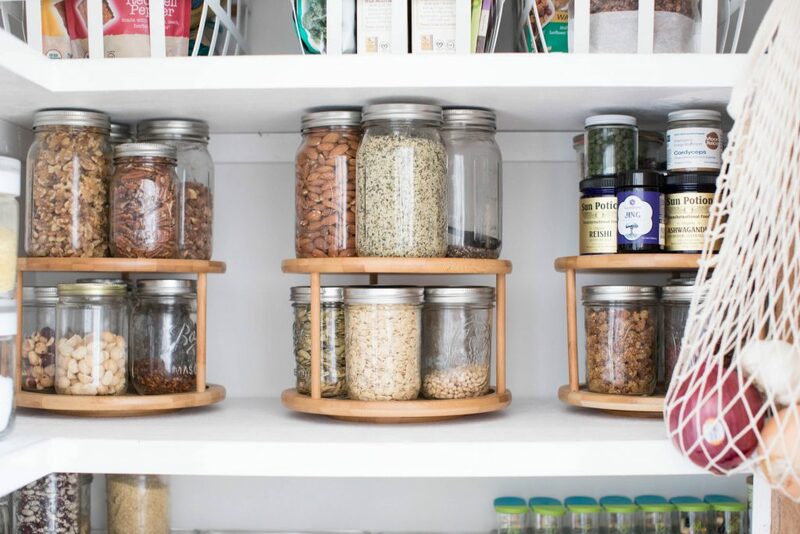 Just like we talked about in the organized pantry article I used bins, jars, and turntables to help me stock everything from spices and herbs to protein powders, beans, flours, and healthy snacks. Organizing your closets can be tricky because they hold all your clothing for every season. My advice is to assign items for each of your closets. For example, one closet will house bed sheets, blankets, towels, and tablecloths. Another closet will store your coats and shoes. Put away non-seasonal things, like swimwear and shorts into separate bins, and keep your winter items such as heavy coats and sweaters front and center. This way you don’t have to go digging for them. To ensure you’re not holding on to things you don’t need, go through your closet and gather everything that you don’t love or really use. Then put those items in a bag and after a couple of months donate or get rid of anything you don’t reach for in that time period. If you don’t miss it in a few months time, it’s likely you don’t really need it or benefit from having it around. When there’s chaos in your home, there’s chaos in your life. Learning how to say no can be hard, but letting go of items that no longer serve you will invite some clarity in your space. That’s why it’s important to assign a purpose to every area. Your living room, for example, is meant for lounging and relaxation, so use baskets to separate magazines and newspapers from games and cards and television remotes. In your home office, take time to get rid of unnecessary papers in your desk drawers. Organize the papers you want to keep in folders and use small compartments to store pens, paper clips, staples, and other office items. Your bedroom is your sleep sanctuary, so make sure to build it with what dreams are made of. First step? Invest in a quality mattress and if you can, choose one that is eco-friendly and non-toxic. A few months ago, I swapped out my old mattress for a mattress from Avocado Green Mattress. I love the brand because their mattresses are made out of organic and biodegradable materials rather than synthetic and potentially harmful chemicals. I also think it’s important to keep bedroom clutter to a minimum. Make sure to pick up clothing off the floor — hang it up, throw it into the laundry hamper or fold it and put it away. You also want to keep surfaces on your nightstand and dressers clutter-free. We tend to take everything into the bedroom — magazines, bills, coffee mugs. Minimizing the number of things on these surfaces will prevent you from feeling stressed out. Raise your hand if you own one too many tote bags or water bottles? Guilty! We all have those things that just seem to build up in our home. Take the same approach with these things as you do with your closet by having a designated bin in your home to put the things you want to get rid of. Take inventory of these items and once a month, donate them to a homeless shelter or thrift store. We all harbor sentimental items that we feel bad for throwing away. Concert tickets, birthday cards, and letters are often tied to good memories, and throwing them away makes us feel like we want to forget about them. But the truth is those things are just another form of clutter. Clearing these items from your drawers will help free up space for things you do need and metaphorically, help you move forward. Now that you’ve organized your home, it’s time to actually get cleaning! I like microfiber cleaning cloths because they leach onto dust, particles, and dirt. Use a wood polish to dust off your furniture and an all-purpose cleaner for kitchen counters, stovetops, and refrigerator shelves. Disinfectant sprays are perfect for bathroom floors and counters since they’ve been exposed to bacteria, germs, and bodily fluids. I also can’t overstate how important it is to ensure that you’re breathing good, clean air while you’re at home. I keep an air filter from the Intellipure brand running at all times to filter through any viruses, fungi, molds, and bacteria that might be hanging out in the air. Think about how your home can help make your daily routines smoother and easier. I like to call this functional cleaning and organizing. Do you like to grab your wallet, keys, and purse on your way out the door? Keep a key and purse rack or holder by your front door so you don’t go crazy looking for them. Want to add more fruit and veggies in your diet? Put a fruit basket on your kitchen counter so it’s the first thing you see when you enter the kitchen. Fill your fridge and pantry with healthy grab-and-go foods, like veggie sticks, whole-grain crackers and jars of nuts, so you’re not tempted to run out for something less than healthy. How do you like to keep your home clean? How do you tackle every room in your home? Share your favorite ways to organize and clean here in the comments below. I’d love to see your home makeovers, so be sure to tag #nutritionstripped on Instagram!